While much of the retail world is rattling with declines in traffic and big omnichannel shifts, Sephora is thinking small, opening its littlest store in North America as it explores a new format. Located on Boston’s Newbury Street, the 2,000-square-foot “Sephora Studio” will focus on personal services and digital experiences. 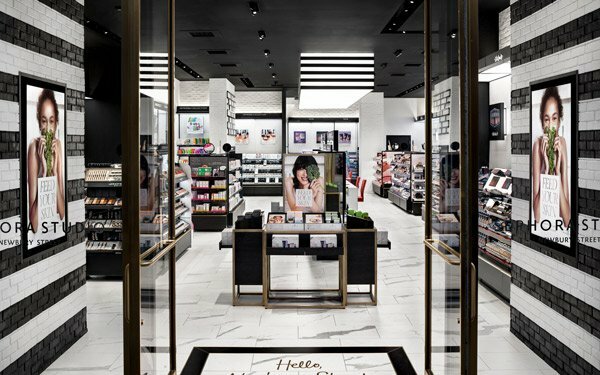 And it’s the latest in Sephora’s size experiments: The opening comes just after it unveiled its largest store in the U.S.–more than 11,000 square feet–in Manhattan, and less than a year after opening its even-tinier Sephora Flash in Paris, a 1,000-square-foot unit specializing in digital innovations, including plentiful click-and-collect options and augmented-reality experiences. Sephora, owned by French luxury giant LVMH, says the Boston store is based on the insight that “there is no better way to create meaningful connections with clients than through personalized experiences and a customized approach to beauty.” “The Studio merges the best of an inclusive neighborhood retail environment with best-in-class digital tools that enable our expert beauty advisors to customize recommendations,” says Sephora in a release. Offerings include 15-minute mini-facials, 45-minute makeovers, Pantone Color IQ touchscreens and omnichannel offerings like rush deliveries from its larger store in the nearby Prudential Center. Both Sephora and rival Ulta are among the top performers in all retail and have sidestepped many of the industry’s woes. In its just-released earnings, LVMH says Sephora continues to increase its share of online sales. But it says the uncertain retail environment means it is approaching the remainder of the year “with caution.” And investors, wary that the Amazon onslaught is headed toward cosmetics, have been cooling to Ulta. But there are plenty of indications that both brands are among the best equipped to battle Amazon. In a recent report, Deutsche Bank says that Ulta holds up well against Amazon, with better access to brands, lower prices and superior web functionality. And Engagement Labs, which measures brands on both word-of-mouth and social-media conversations, says Sephora and Ulta both rank in the top five of all cosmetic brands, and the top 10 compared to other brands in the retail category, which included 60 companies.